What the player really wants to know is whether a pair of table tennis shoes will make any difference to his performance compared to a standard pair of trainers. Will table tennis shoes help him play better? Yes, probably, maybe, it depends. I played for many years with running trainers, but eventually decided to buy some table tennis shoes a few years ago. At first a felt a bit flashy. It seemed as though I was trying a bit too hard – taking it all a bit too seriously by wearing proper table tennis shoes. And the honest truth is, I don’t think they made much difference to my game at all. At that stage my footwork was terrible (it still needs a lot of improvement). As my feet were so planted it didn’t really matter if I was wearing table tennis shoes or a pair of wellington boots. I simply wasn’t going to move! But as I improved as a player and I started to move my feet more, I started to feel the benefit of having a decent pair of table tennis shoes. Table tennis shoes are designed to make movement easier. This means they are light, they have good grip and quite a thin sole to reduce the chance of you rolling your ankle as you move side to side. If you have a good stance, with the weight on the front of your feet, rather than your heels, you will feel the benefit of table tennis shoes. Moving from side to side, forwards and backwards, will feel easier than a standard pair of trainers. When I wear my table tennis shoes now, I just feel that little bit quicker, that little bit shaper, that little bit more able to move into position to play my shots. The main disadvantage of table tennis shoes is that they don’t have much shock absorption. As the shoes are light with thin soles, they don’t give your joints much protection. This isn’t really an issue if you are playing on a nice taraflex or sprung wood flooring, as these surfaces will act like shock absorbers anyway. But if you are playing on a hard wooden surface (or even concrete), your joints are likely to suffer much more. I suffer with knee pain. I’ve had three operations on my right knee and 20+ years of overcompensating with my left knee. My knees do ache if I use table tennis shoes on hard floors. So I don’t always wear my table tennis shoes when I play. It depends what the playing surface is. If it’s a hard surface I’d rather use my running trainers to protect my knees, even though I won’t be able to move quite as well. If you’re a beginner with underdeveloped footwork, you’re probably not going to notice any difference. There’s no harm in buying a pair of table tennis shoes, but they are not going to transform you into a world class table tennis player! If you’re an intermediate or advanced player, with decent footwork, then table tennis shoes will help you move better. You should be able to move quicker between shots, change direction more easily and generally feel lighter. If you can move better, you will be able to play better. But I don’t want to overplay this. You may experience some improvement to your play but it is only going to be a marginal improvement – an extra 1%. 1% doesn’t sound much of a marginal gain, but it’s better than 0%. And you have to wear something on your feet when you play, so you may as well wear shoes which may help you play 1% better. The other factor is the playing surface you play on most frequently. If you play on a hard surface, then table tennis shoes may not be the best option. You may actually play better with some trainers with a bit more spring. And if you suffer any joint pain (ankles, knees, hips), table tennis shoes on a hard surface may cause you too much discomfort. But, if you are fortunate to play on a taraflex or sprung wood floor, then table tennis shoes can help you move better and play better. 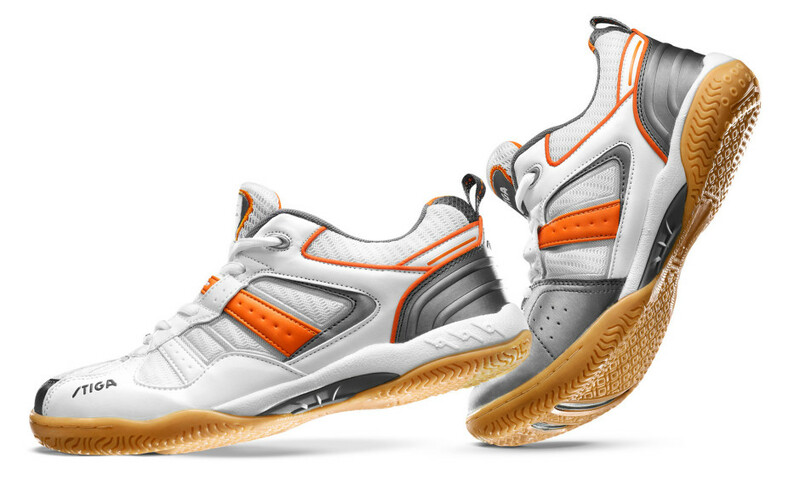 Where can you buy table tennis shoes? Table tennis shoes cost between £30 and £100+. You can purchase from most table tennis shops. Take a look at my list of table tennis shops in the UK, USA, Europe, Asia and Australia. You can also find some deals for table tennis shoes on Amazon (Amazon UK | Amazon USA). interesting post. I had wondered whether to buy specialist table tennis shoes when I took up the game seriously last year but in the end bought a good pair of cross-trainers (Asics) from a local shop that specialises in running gear. These have good shock absorption (essential for me as I also have problems with my right knee) but are also fairly lightweight. So glad I did now after reading here that table tennis shoes are fairly thin-soled. I’ve had no knee problems at all, touch wood, so I’ll be sticking with what I’ve got for now. I think it also depends heavily on your feet. Personally I know that if I would wear normal running trainers when playing, with all the lateral movements my feet would be destroyed. I think buying dedicated inside sport shoes are completely worth it, but I don’t think they have to be dedicated table tennis ones. I have Asics ones, and I’m very happy with them. After a couple of pretty serious ankle sprains I would say that table tennis shoes are an excellent investment. It does not stop me from spraining my ankle but table tennis shoes are very low (low padding) and that allows the sprain to be minimal compared to running shoes with lots of padding. I’ve sprained my ankle a few times playing TT but only once badly: when I was wearing running shoes.